Tools for processing single microarray slides, such as Agilent SureHyb Chambers, are out of step with trends toward higher throughput sample analysis and the use of laboratory automation. The Mai Tai Hybridization System [Cat.# 1075-00-1 (115V); 1075-00-2 (220V)] replaces one-at-a-time slide incubations with batch processing of four slides at once using an automation compatible design. When hybridizing four microarray slides, Agilent SureHyb Chambers require handling four individual chambers and twelve separate parts. The Mai Tai Cassette design uses just two parts that simplify set up and disassembly steps and reduce the risk of errors. The Mai Tai Cassette has a standard microplate footprint so samples may be loaded manually or with robotic liquid handling equipment to streamline workflow and reduce the risk of errors. The Mai Tai System provides 'bubble mixing' of samples during hybridization, a proven method for boosting signals from samples with limiting target amounts. The flexible design of the Mai Tai rotator allows processing of up to eight Mai Tai Cassettes or 32 slides using a SciGene Series 700 Microarray Oven. Cassettes are easily and securely loaded into the rotator by means of a spring locking mechanism. Complete microarray hybridization system consisting of rotating oven, rotator and hybridization cassette. Unique convection heating system regulates chamber temperature to ± 0.2°C; eliminating hot/cold spots. Two ovens are available: the Model 777 rotates to 80 RPM for Agilent or Affymetrix arrays. Model 700 rotates to 20 RPM for Agilent arrays. Uses simple two-piece 4-slide cassette. Rotator holds up to 8 cassettes (32 slides) for rotational mixing during incubation. 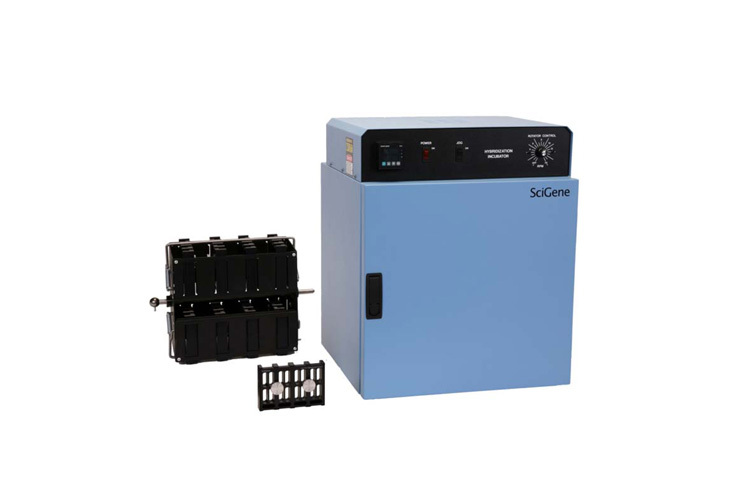 Mai Tai rotators are available for SciGene, Agilent and Robbins Scientific ovens. Compatible with SciGene & Robbins Scientific Ovens The Mai Tai System is designed for use with a SciGene Series 700 Microarray Oven or with the widely used Robbins Scientific Model 400 Oven. Both ovens offer long term durability, and highly regulated temperature control. SciGene ovens are CLIAcompliant with built-in temperature validation and calibration features to ensure accurate incubation temperatures.